In Restoring Health: Body, Mind and Spirit, Rev. Ed Hird takes us through the Bible book of Titus. Using that three-chapter book (a total of just 46 verses) as his outline, he addresses a wide range of issues, from the worker’s need for physical health and fitness to decrying the introduction of New-age elements, like labyrinth prayer, into the modern church. The Island of Crete, where Titus pastored, was an island of pirates. Hird delves into pirate history, practice, and folklore to show us the type of people that were in Titus’s congregation. Alongside that exposé he shows us how we in the modern North American evangelical church have many of the same pirate tendencies. Hird then interprets Paul’s instructions to Titus for us, giving pastors, teachers, and lay people much food for thought on how to recognize and deal with the rebellious, deceitful, immoral, and idolatrous pirate behavior that has and is creeping into personal lives and churches. Hird speaks openly of his own experiences. The book is written in a warm, chatty style with Hird often sharing personal and family anecdotes along with his experiences as a working pastor, and the fruit of his research. However, I do feel that some of his stories and illustrations take the reader on tangents that aren’t vitally connected to his message and in that way blunt the book’s focus. Also, the Table of Contents lists the verses from Titus as headings, but doesn’t list the modern issues Hird addresses as he expands on those verses. The book would be more helpful as a reference if the modern issues addressed, such as the need for exercise, principles of giving, yoga within the church etc. etc. were also listed in the Table of Contents or an index. All in all, though, this is an interesting commentary that gathers its material from sources as varied as Hird’s visit to Crete to the writings of many including John Calvin, John Stott, William Barclay, C.S. Lewis, even Poor Richard’s Almanac. Above all it is based firmly on the Bible. The book is thoroughly footnoted and includes a bibliography for those who would like to do further study. It would make a fine addition to the library of any minister or Bible teacher. 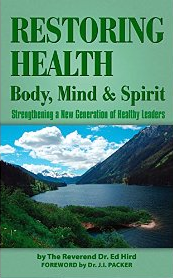 I received Restoring Health: Body, Mind and Spirit as a gift from the author for the purpose of writing a review. I commend to you Violet Nesodly’s review of Restoring Health: body, mind and spirit. I was intrigued by the title — as it addressed one of my foremost concerns. I’m a firm believer that the church’s primary ministry is healing, and that we’ve lost much ground to New Age practices because we aren’t consciously and conspicuously enough addressing body-mind health issues (we focus almost exclusively on spirit-health, I think). Meanwhile “they” are offering healing principles that make the body stronger (exercise and diet) and calm the mind (meditation). Do you recommend the book for ministers and teachers (I am neither of those) because it is mostly theoretical, and not necessarily about daily practice? Tracy, it has lots of practical advice for daily practice too. I guess its commentary-type format (verse-by-verse exposition) made me think it would be more attractive to people who do that kind of close reading with a view to, perhaps, expounding on the passage in a message or article. What I mentioned in the review, about the need for these modern subjects to be noted in a table of contents or index, applies here. The good stuff is there, but you have to read the whole text (which is also a bit of personal anecdote, travelogue, historical fact, quoting experts etc.) to bump into it.